Excited for a fresh start? One way you can do that for your body is through cleansing. But what does it entail and what happens to the body when you do it? What is cleansing / detox? You may have heard it from friends or through a celebrity; someone is undergoing cleansing at any given time. Basically, detox (detoxification) diets and cleanses claim to clean the blood and eliminate harmful toxins from the body. These cleanses are usually short-term dietary interventions that involve a period of fasting. This is followed by a strict diet of vegetables, fruits, fruit juices, and water. Some cleanses also involve the use of detox infusions or teas, and even supplements. 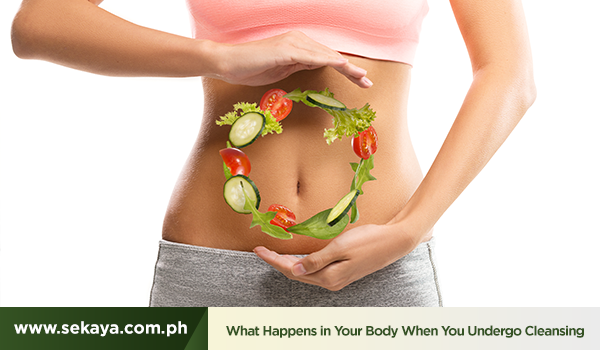 What happens to the body during cleansing? With this lighter dietary load, the body is able to expel accumulated toxins, reducing the burden on the skin, liver, and other organs. • The liver, whose primary purpose is toxin elimination, is further stimulated. • The body’s cleansing organs are allowed to rest. • Toxins are eliminated from the body through urine, feces, and sweat. • Blood circulation is improved. • The body is refueled with healthy nutrients. A detox or cleansing basically helps clear the body of impurities that are adversely affecting the body. With these impurities gone, the body’s natural filtering system goes back to normal. 1. Include plenty of fiber in your diet including fresh fruits, vegetables, and brown rice. 2. Drink 2 liters of water daily. 3. Practice deep breathing. This allows oxygen to circulate better through your system. 4. Exercise for 30 minutes to an hour each day. 5. Drink botanical infusions for cleansing. Sekaya Gentle Detox is a blend of burdock root, dandelion root, peppermint leaf, and other botanicals that help strengthen the body’s detoxification actions. Important: Please consult your healthcare professional before starting any detox of cleansing program, especially if you have a serious medical condition or are taking any medications.